Your photo and details are correct, WESERLAND ex MARIE SCHWINGE built 1938 by Lühring as last Schooner. Registered owner in GL Register 1960 was Hans Trüper, Brake, homeport was Bremen. Good documentation in Detlefsen`s Vom Ewer zum Containerschiff. My father he drove on the Weserland from 6.8.63-14.2.65 Distinguishing Signal DDOS, 240 BRT, owner Ernst Otto Bürger. In the ship list of the German shipping companies from 1964, the Weserland ex Marie swing 1938 is listed as described in my photo. The photo shown by you shows the Weseland as Marie Schwinge. What is missing in your link is the name Weserland she must have had before 1969. 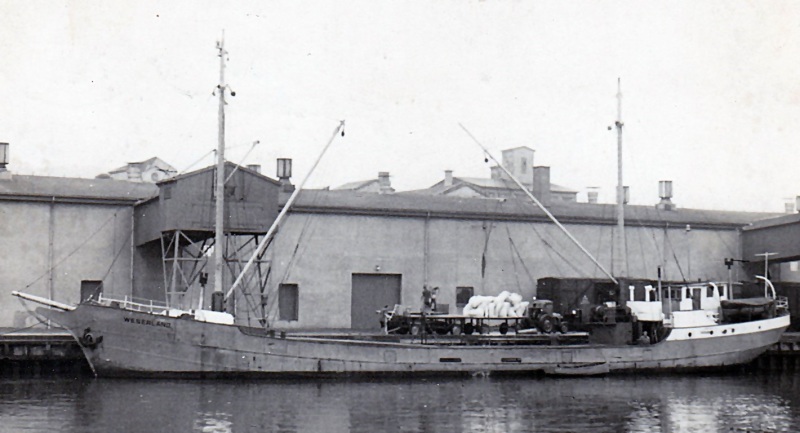 I'm sure your picture shows the 1921 Wewelsfleth built EMMY FRIEDRICH which was sold in 1927 and renamed MARIE SCHWINGE.